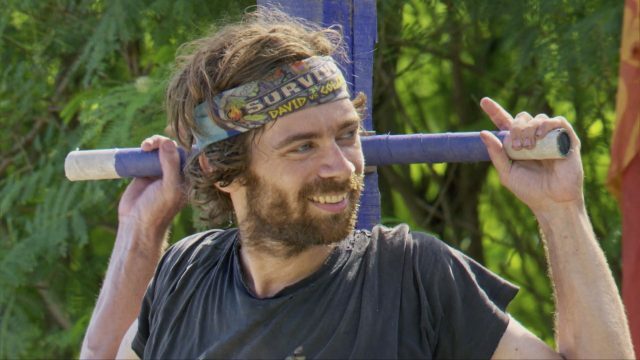 It’s been a long time since we’ve seen a Survivor castaway as popular as Christian Hubicki. He quickly became a fan favorite on David vs. Goliath for his quirky personality, but his high likability also made him an even bigger threat to win. Although he was able to overcome repeated attempts to end his game, Hubicki was taken out just a few days away from the final Tribal Council. SheKnows had the opportunity to chat one-on-one with Hubicki, and it was a fascinating discussion in which he explained why he believed the jury was favoring him for the $1 million prize. Plus, he revealed his feelings about his closest ally, Gabby Pascuzzi, turning against him and talked all about being a huge Survivor superfan. He even ranked his favorite seasons — including this one. SK: With everybody viewing you as such a strong player, how confident were you in winning it all? CH: I think I had a very good chance. Here’s the way I see it. I had been targeted at the final 13, final 12, final 11, immune at 10, targeted at eight and targeted at seven. If I get all the way to the end after that, I think it would be hard for any jury to say, “Christian, you avoided losing all that time. Guess what? You lose anyway.” That’d be a hard thing for them to do. SK: If you had your dream final three, who did you want to go to the end of the game with? CH: I honestly did not care. As long as I got to the final three, I would’ve been happy. Not just because I would’ve beaten any of these guys — that’s not what I’m saying. It’s more that I was targeted so often and so frequently that getting to the final three was such a daunting task, and placing any constraints on myself or who to take with me would’ve inherently impeded my game to get to the end. That’s what I was really in search of. Who would maybe make the decision to take me just a little bit deeper and a little bit closer to the final three? That was my sole consideration. SK: What was going through your mind when you first learned that Gabby, your closest ally, was now targeting you? CH: Davie tells me, “Gabby is coming for you. She feels like she has to make a move.” I thought, “That makes perfect sense. Of course she is.” I always knew, at some point, Gabby would have to target me. I knew she wasn’t going to be a person who wanted to appear to have been dragged to the end. I wasn’t dragging her; we were strategic partners. The problem was, I kept absorbing the credit for these moves, which I did not want. I did not need credit for the moves that I was involved in. People just kind of gave it to me because I’m the guy with glasses. So, of course she targeted me. I thought she probably believed I would see it coming at five, six or seven, but not at the final eight. It makes sense she’d come for me. SK: Gabby’s plan backfired, though, when you played your hidden Idol to save yourself. Let’s talk about that moment because it seemed as if you weren’t entirely sure if you were going to use the Idol as your eyes danced around Tribal Council to gauge the other players. CH: The looking around at Tribal Council, that was theater. Not theater for you, the audience member. It was theater for the people in the game. I had been tipped off by Davie, but I wanted to work with Davie next round. Any indication that I already knew I was being targeted before that vote could jeopardize his standing with that group and therefore blow the element of surprise of me working with Davie next round. It wasn’t even just Davie. Right before Tribal Council, I got approached by three different people separately. They said, “Tell no one I told you this, but you’re being targeted.” I was told by Mike, Angelina and Nick. I knew I was playing my Idol, but I had to pretend at Tribal Council I had sniffed it out somehow. I invented this whole acting scheme where I would pretend like I’m feeling out the crowd, looking into Gabby’s eyes and knowing she was lying to me. But none of that was real. It was all for the purpose of hopefully doing better next round. SK: You’re an extremely popular player, so some viewers were angry that Gabby turned against you and now she’s getting heat for it on social media. What’s your reaction to all that? CH: I would just tell any people upset with her for targeting me, probably the person least upset about it is me. I knew she had to make this move at some point. In fact, I was weirdly proud of the fact that she’s taking the game into her own hands. I’m glad it didn’t work, but I was never mad at Gabby for making that move. Some people ask me if I forgive Gabby, but there was really nothing to forgive. SK: Nick crafted a fake Idol and pretended to find it himself to fool everybody into thinking he discovered the only hidden Idol in the game at that point. Did that really stop the group from searching for another Idol? CH: Yes. I think it did. I think it was a very effectively done trick. I have to give credit to Nick for how he executed that. In hindsight, there were signs that it was fake from what I knew, but you’re not in your full faculties at the time. He did trick me, and I didn’t look for the Idol as a consequence. I was like, I have to find another way, a social way, to stick around. Davie had the benefit of knowing Nick already had an Idol and already had the parchment for a clue. I didn’t know that. It made sense that it was the real thing, but Davie had the pieces of the puzzle and was able to put together as to what went down. I give a lot of credit to Nick for pulling that off. SK: You may be one of the most popular players the game has seen in years. Are you getting recognized by fans in your day-to-day life? CH: I’m getting recognized quite a lot on the streets of Tallahassee and sometimes in other cities when I go and visit people. It is very strange, but it’s flattering. People come up and want to take a picture with you. It does make going to the grocery store a different experience now. I’m walking in the aisle, and all of a sudden, someone will just come out of nowhere and say, “Are you on Survivor? Can I have a picture?” It’s to the point where it almost makes you paranoid, not that I don’t want people to come up to me, but anybody taking a weird step in my direction it’s like, “Is that person gonna talk to me? I don’t know.” It’s been taking some getting used to, but it’s been pretty fun, too. SK: Fans are saying this is one of the best seasons of all time. Being a Survivor superfan yourself, how would you rank this season among the others? CH: This season has got to be, in my opinion, in the top tier. People love Pearl Islands, and I do as well. One of my favorites is Cagayan; that’s just an amazing season. There’s Heroes vs. Villains, and of course the original Borneo or Fans vs. Favorites. Where do you place this season in that tier? I think it comes down to personal preference and your personal background of when you started watching the show. I think being a top-tier season, it’s enormously flattering and feels quite appropriate given all that’s going on this season. There are so many things that happened this season that are just so awesome. SK: Being a superfan, do you have a Buff collection or anything like that? CH: I am a rabid strategy fan, so I don’t collect the DVDs or the Buffs. What I do is write computer programs that would simulate various aspects of the game. I’m that kind of fan. When I talked about doing slide puzzle algorithms, I got interested in slide puzzles because I started watching Survivor. There was a game in season five called Thai 21. I was like, there’s an algorithm to solve that. It’s a solved game. They shouldn’t play that game anymore. I love the puzzle challenges and I love the concept of the strategy more so than the paraphernalia of the show. Just that fascinating dynamic, non-linear experience that is playing the game of Survivor. SK: Which previous contestant are you most fascinated by? CH: I was a big fan of Cochran. He was great. I am fascinated by how well Cirie has been able to play on her various outings, even on Survivor: Game Changers, when she got all the way to the end and was the only person left who could get votes. I was just so impressed she was able to make it so far despite having such a target. I think that speaks to someone like Cirie or Sandra and their ability to maneuver the social game in a fascinating way. CH: I had been applying for years. I started applying way back when Cochran was cast, actually. I would apply and hear nothing, so as far as I was concerned, my videotapes were going off into the void. I had applied for a number of years and I had to take a break because my job would not allow me to go. I was about to get a professor gig, so I thought if I was going to do that, it might be my last chance to play. I sent in another application to see if I’d get lucky. Sure enough, I got a call the next day, and that started the whole process to get on the show. SK: Lots of fans would love to watch you play the game again. Would you? CH: I would certainly take the call, and I would consider it very seriously. The experience of being out there and being so wonderfully creative in how you get to talk, plot, collaborate and work with these strangers in such a fluid way is so addicting. On the other hand, I have started a new robotics lab in my university, so I would have to make sure if I were to go that all that would be able to run without me. It certainly is a very interesting prospect.